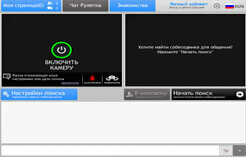 Simple live chat with web cam. Happy talking! Random video chat - talk with random strangers! Choose video chat and communicate! Dear guests, we present you a lot of video chats, where you can communicate with strangers. On this web site, you will be able to find the most popular video chats in Ukraine, Russia, USA, Germany, France and other countries. Just choose the desired video chat and communicate there. 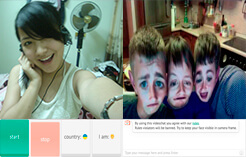 Live video chat helps you to meet people from all over the world. With Chateek.com you can have a great time, find new acquaintances and learn plenty interesting things. The Chat list is always updated with new releases. You will always find an interesting video chat and discover a video dating for yourself. This web site has a great selection of video chats. You can subscribe to our twitter today and get the news about the new video chats release. 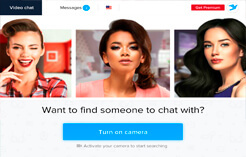 First of all, Chateek.com - the best way to find a new relationship, dating, and even love! If you have everything that you need for interactive communication on the Internet, you can greatly improve your life. Simple text chats are not popular nowadays as there is a pretty poor interaction between interlocutors. However, in the video chat you have an ability to see each other and be a part of a real conversation. There is nothing better than communication via video chat with a person who is far away from you. Random online video chats connect you with a complete stranger from anywhere in the world. You can select some preferences, but still won’t be able to know who will be your next companion. Most of the video chats are for free, so you don’t have to worry about money. Just go ahead and run a chat, turn on webcam and communicate as much as you want without registration. Any chat room is always open for you on our web site, we have collected almost all the best services for fast video dating. Sometimes video chat cannot work. This may be due to firewall or proxy settings. People in video chat can play a video, this is very interesting. But be careful! It is called online chat, because you can start communicating really fast. In our online chat rooms, you can meet a person for the shortest time period. Such dating usually ends with the contacts exchange, namely, skype, icq, telephone number and links to profiles in social networks. Furthermore, there is a great possibility to meet in a real life. However, sometimes video chats can change your privacy. Another point that must be mentioned, is that in video chats you must follow certain rules of etiquette. To be more specific, try to have a nice look and make sure that your interlocutor can see and hear you. Try to smile and be friendly, it will help you to find more good buddies. Unfortunately, sometimes in chat rooms you can meet a person who can insult you. In this case, was created a function of sending complaints to such users. Keep in mind that in any ChatRoulette you will immediately see your partner after the connection. You should not abuse this person and does not show more than individual wants to see (hope you understand what we mean). Therefore, we strongly recommend you to start with clarifying your purpose of being here.